2017 is the year of Legends for Welsh Tourism and at the very top of the list of events and attractions is an absolute cracker The Tournament – Conwy. Whether or not you are a follower of Game of Thrones, Last Kingdom or any medieval, fantasy story or not The Tournament will set your soul on fire. The Tournament is a true medieval tournament that will revive the days of legend, kings, queens, knights and damsels in distress. On 24th and 25th June, Conwy plays host to the biggest and most exciting medieval tournament seen in many centuries and will be something no tourist to North Wales will want to miss. Since days of old, Conwy has hosted fairs and markets that have attracted tradesmen and merchants from all over the kingdom and The Tournament revives the tradition bringing it bang up to date for 2017. Merchants in traditional medieval dress will purvey goods with a medieval theme that include food, period clothing, jewellery and a host of interesting and unique items. This market is a must for the whole family with its sights, sounds and smells will creating the feeling that you have travelled back in time over 700 years. Throughout the event world renowned medieval re-enactors will recreate battles, scenes that include fearsome Vikings who pillaged their way through much of Britain towards the end of the Dark Ages through to brave, and handsome knights in shining armour. Every aspect of life from ancient times that are almost forgotten from cooking to falconry to arrow making will all be re-enacted with many opportunities for visitors to try their hand at some of the tasks. Authentic music plays a part in this outstanding event and some of the biggest names and most authentic performers of historic and medieval music invite guests to simply sit back and listen or join in the festivities and dance. One of the biggest names in this kind of music is Serpentyne who leave their audiences mesmerised with haunting melodies and tunes that reach deep inside the soul. No tournament would be complete without the impressive sport of Jousting. 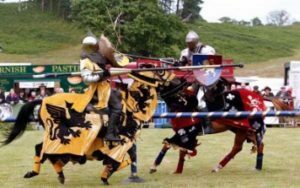 Taking place among the battlements of Conwy Castle, The Tournament will host one of the most impressive jousting tournaments Wales has ever seen. 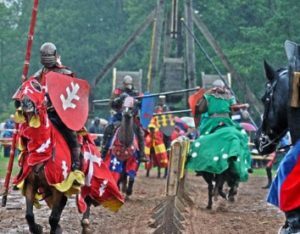 The whole family will feel the rush of adrenaline as legions of brave and gallant knights fight for the hand of a fair maiden, demonstrating the art of jousting and bringing the excitement of this Medieval sport back to life. Over just two days The Tournament turns back the clock over 700 years and promises to be the event of a lifetime for people of all ages. But to top off the event there are a limited number of seats available for those wishing to attend the ultimate Medieval banquet on the feast day of St. John the Baptist. At this prestigious banquet, the pinnacle of the entire event, held on 24th June those lucky enough to be sat at the tables will be served a mouth-watering feast of medieval dishes whilst being entertained by fools, jesters, jugglers and more.